Termites perform beneficial processes for the environment of North Texas, but feeding on your home isn’t one of them. No wood-eating insect is more destructive to North Texas homes than the subterranean termite. These insects often go completely unseen, hiding inside moldy and rotting wood, and cause thousands of dollars in damage to homes across this region. Termites actually do a lot of good for the environment, as they live by digesting dead and rotting cellulose (wood) that would otherwise clutter our world. Conflict occurs when the rotting wood they are consuming is a part of your house. At Entex Pest, centrally located in the Dallas/Ft. Worth area, we have the experience needed to fully inspect your home for termites, the skill to protect it from any further termite damage, and the confidence to offer a protection guarantee. HOW DO SUBTERRANEAN TERMITE INFESTATIONS BEGIN? Subterranean termites live, as their name implies, underground. They are social insects that are organized into a caste system with a long-lived termite queen responsible for populating the colony. A colony is generally established 2-4 years before producing a “swarm” or mating flight so new colonies may be established. A male and female alate, or reproductive termite, mate during a colony swarm and pair off to dig a nuptial chamber in loose soil. These two insects begin a new colony which may number into the thousands in just a few short years. HOW DOES AN INFESTATION PROGRESS INTO HOME DAMAGE? 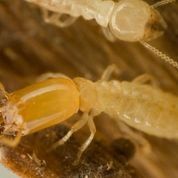 Termites support the colony by feeding on cellulose materials. These materials include wood, paper, cardboard, and even burlap. Termites have microscopic organisms called protozoa in their gut system which digest the cellulose for the insect and convert the plant material into energy. Once a food source is identified, a tunnel is built up through the soil to the wood item (possibly your home) to protect the termites while they forage. Above ground, these tubes are called shelter tubes and are made of soil. The shelter tubes protect the delicate termites from drying out since they maintain a constant humidity and fairly stable temperature. ARE THERE ANY SIGNS OF TERMITE INFESTATIONS I CAN LOOK FOR? The mud ‘shelter’ tubes are most often the lone clue to a termite infestation. HOW DOES ENTEX PEST INSPECT AND PROTECT AGAINST TERMITES? Entex, through training hundreds (even thousands) of salespeople, technicians, and concerned customers, have honed our scientific termite inspection process. We understand exactly how soil conditions coupled with different building techniques can create a perfect home for subterranean termites. We offer a scientifically sure termite protection service unmatched by other service companies. Entex Pest controls termites with all the modern application techniques and products, including natural alternatives, baiting systems, Termidor termiticide, and Altriset termiticide for the environmentally minded customer. WHAT DOES A ‘PROTECTION GUARANTEE’ INCLUDE? Entex Pest guarantees your home will be protected against termite re-infestation after the initial treatment. No gimmicky monthly or quarterly payments to provide a small treatment should termites ever appear. No “pay as you go” gimmicky termite plans. We simply offer timely and efficient solutions, should your property encounter termites. We employ all the modern applications and techniques in order to find the best possible fit for your family and your property. If you believe your home or property may be infested by these insects, contact Entex Pest today. Our expert professionals will evaluate the problem and create a custom-fit, tailored treatment plan just for your property.